Sound waves traveling through rock will have a certain velocity and attenuation that is a function of the rock properties. Such properties as density, rigidity, porosity, saturation and fracturing will cause sound to be altered. By measuring these resulting waves, the sonic log can be very useful in understanding rock formations. 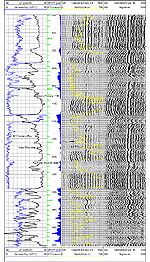 Information concerning how tight the rock is, whether it is saturated, fractured or if the formation is above the regional water table can be understood using the sonic log. It provides measurements about the mechanical properties of the rock. Combining this with resistivity and gamma-ray logs can aid in understanding rock properties as a greater whole than by just merely the individual logs. ITT Integrated Transit Time: The integration of the ∆t wave over a distance traveled between two corresponding depths; usually represented by marks scaled as a millisecond between depth intervals. SPOR Sonic Porosity: If the matrix velocity of the formation is known, using Wyllie’s equation, log porosity can be derived. The sonic tool needs to be centralized and conducted in fluid filled boreholes of water or drilling mud. 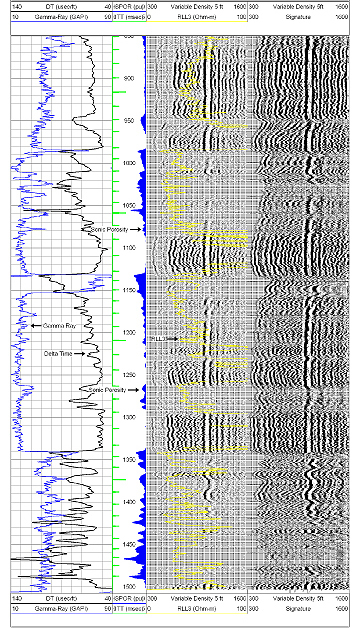 In shallow wells, pressure gradient can affect the logs along with borehole diameters. Lithological correlation is possible with drill cuttings, core, or other geophysical measurements. Click on thumbnail for a larger image of the SONIC VELOCITY sample.